EVGA will soon ship its dual-GPU GeForce GTX 460 2Win and Galaxy is apparently also planning to release a dual-GPU card based on the GF104. The card uses a snow-white PCB board and offers 1GB GDDR5 per GPU. If the EVGA card is any guidance, this model may be up to 10 percent faster than the GeForce GTX 580, but pricing and availability is unknown. 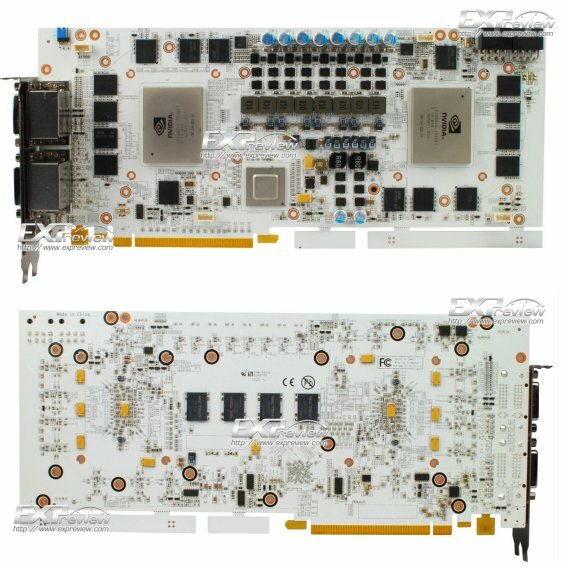 Further, both display outputs of each GPU is wired out in the form of DVI connectors, making the card a single-piece 3D Vision Surround solution. Interestingly, Galaxy chose a bridge chip other than nForce 200 to run the SLI on a stick solution. If Galaxy's implementation clicks, then every AIC partner with its own R&D could work on their own dual-GPU cards, currently, they're held back by non-supply of nForce 200.